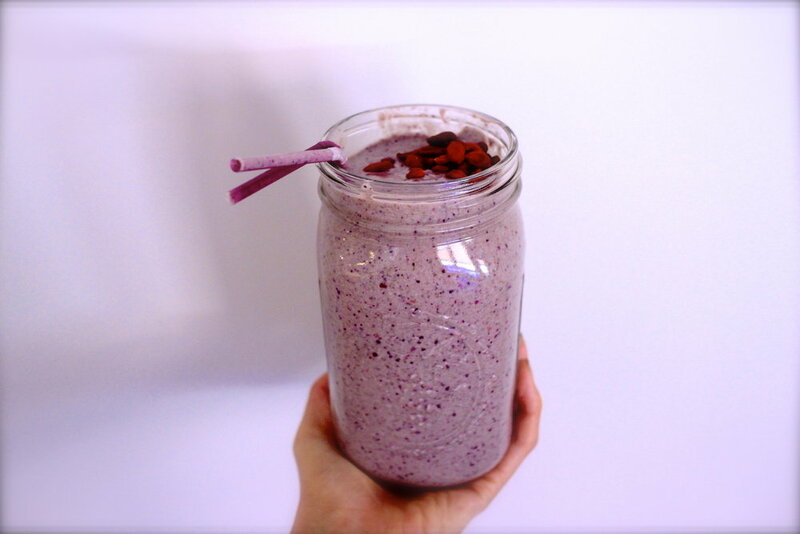 Put milk, ice and berries in a blender first, then add powders and chia seeds. Blend on high until combined. I topped with goji berries. We all have those days when a little extra boost is needed - instead of grabbing a cup of coffee in the mornings make this berry superfood smoothie to kick start your day. Full of super foods, flavour and protein you will be satiated and give your insides some extra love. I have used maca root powder, lucuma, chia seeds and maqui berry powder in this dairy free, gluten free, vegan smoothie. We have spoken about the health benefits of Maca root before here. It has a slight caramel taste and can help to balance hormones, enhance libido and provide energy. Maca is also a great source of protein for vegans as it contains all of the essential amino acids. Lucuma is a new pantry staple in my house and one that works so well in baking and smoothies thanks to its sweet taste. Lucuma contains beta-carotene, vitamin B3, zinc and fibre. Chia Seeds are highly nutritious and a a must in any smoothie thanks to their high levels of Omega 3, omega 6, protein and fibre. Soak the seeds in water for 10 minutes before adding to smoothies/juices to double their size and help them sweep through your GI tract and regulate blood sugar levels. Maqui is a purple berry that is native to South America. Maqui is incredibly high in anti oxidants so being able to eat this plant in powder form is great as you are consuming a large amount of nutrients at once.